This traditional sweet German Christmas bread is much simpler to make than it looks, so please don't be alarmed by the length of the recipe. The richness of the dough means you need to allow more time for proving than normal bread; the recipe should take about 4 hours from start to finish. 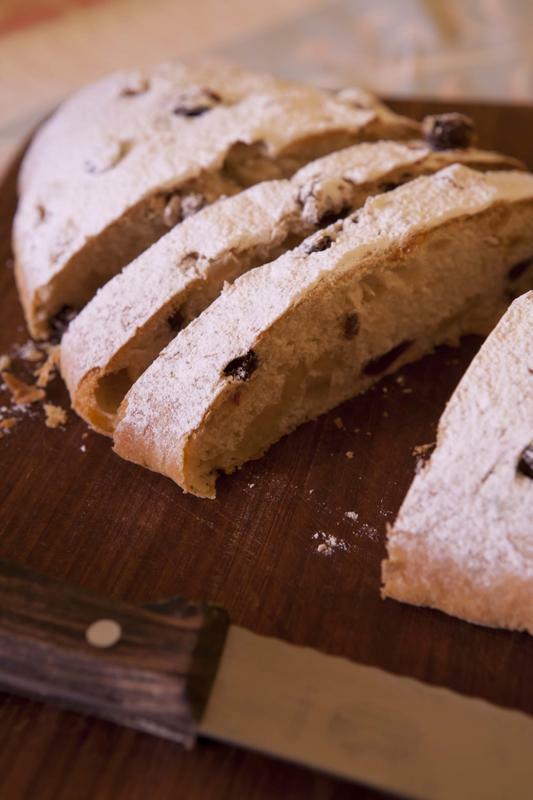 You will find this stollen much nicer than the shop-bought alternatives and it doesn't need to be made at the last minute. In fact, it is best made well ahead to allow the marzipan time to relax into the fruit-packed dough. Place the raisins, glacé cherries, orange zest and rum in a bowl and toss to mix. Cover and leave in a warm place to macerate and allow the raisins to plump up while you make the stollen dough. Melt the butter in a small pan, then leave to cool down. Warm the milk until tepid (not hot), add the yeast and sugar and stir until dissolved. Set aside until the mixture has started to bubble. Sift the flour and salt into a large mixing bowl. Make a well in the centre and pour in the yeast mixture, melted butter and beaten eggs. Mix first with a wooden spoon, then with your hands, until the mixture forms a dough that comes away cleanly from the bowl. Turn the dough out onto a floured surface and knead until it is soft, elastic and no longer sticking to the surface. Alternatively, use a free-standing electric mixer fitted with the dough hook to bring the dough to this stage. Lightly oil a large bowl, place the dough in it and turn the dough so that it is covered all over with a thin layer of oil. Cover the bowl with cling film and leave in a warm place for 1–2 hours or until the dough has doubled in size. Turn the dough onto a lightly floured surface and knock back. Flatten the dough with the palm of your hand and sprinkle with half the rum-soaked fruit, flaked almonds and crushed cardamom seeds. Mix in by first folding the dough over the fruit, then lightly kneading until the fruit is evenly distributed. Repeat until all the fruit, plus any residual rum, has been worked in. Divide the dough into two pieces. Flatten each to a rectangle about 25x15cm. Split the marzipan in two and roll each piece into a sausage shape the same length as the dough. Position a marzipan roll along each dough rectangle, slightly off centre. Fold the dough over the marzipan to make two long, loose loaves. Place the loaves, seam side down, on a floured baking sheet. Cover with a tea-towel and leave in a warm place for 1–1½ hours until doubled in bulk. Meanwhile, preheat the oven to 180°C/Gas Mark 4. Bake the loaves for approximately 25 minutes, until pale golden. Immediately brush the stollen with the melted butter, then transfer to a wire rack to cool. Once cold, dust freely with icing sugar. Wrap in greaseproof paper and store in an airtight tin for a week or so before eating. This stollen will keep for up to 3 weeks.